If you or a loved one has been injured, call us today to schedule a free consultation. We have recovered millions of dollars for our clients in California. Bankruptcy is a beneficial financial strategy used by millions of Americans to clear your debts, stop your worries, and get a SMART fresh start. These, and many other types of injuries can affect you in a very personal way, both physically and emotionally, as well as financially. It is critical for those suffering serious injuries to have legal representation as soon as possible in order to protect your rights. The Law Offices of Steers & Associates prides itself on our caring attitude and personal attention to each client. We’re interested in your individual needs; be it your medical treatment, vehicle repairs, financial concerns, addressing other personal matters related to your injury; and importantly, with providing you candid, easy to understand legal guidance that works. See answers to frequently asked questions on many of our comprehensive pages such as this one: Los Angeles Auto Accident Lawyer. Vehicle collisions are unfortunately all too common and can dramatically change your life. An auto accident can not only wreck or damage your car, but can cause serious and permanent injuries. Truck accidents can be very dangerous due to the large size and weight of the truck and the force of the impact that can occur as a result. Truck driver skills vary; sometimes they are not as attentive as they should be due to pressures from their employer to deliver the goods that are being transported within a certain period of time. Motorcycle riders often sustain serious injuries when they are involved in an accident since their bodies are much less protected than someone sitting inside of a car. Motorcycle riders who get injured in accidents not only have to deal with the after-effects of their injuries but also the biases of a certain part of the public. A bus crash and bus accident carry the same consequences, whether it is injury to your property or person, each person who is hurt by the negligence of the driver or the mechanical composition of the bus itself is entitled to compensation as a result of their injuries. Bicycle riders often sustain serious injuries when they are involved in an accident since their bodies are exposed. These accidents can result in large medical bills; costs related to replacing the damaged bicycle; lost wages; and depending on the extent of injuries, possibly reduced future earnings. 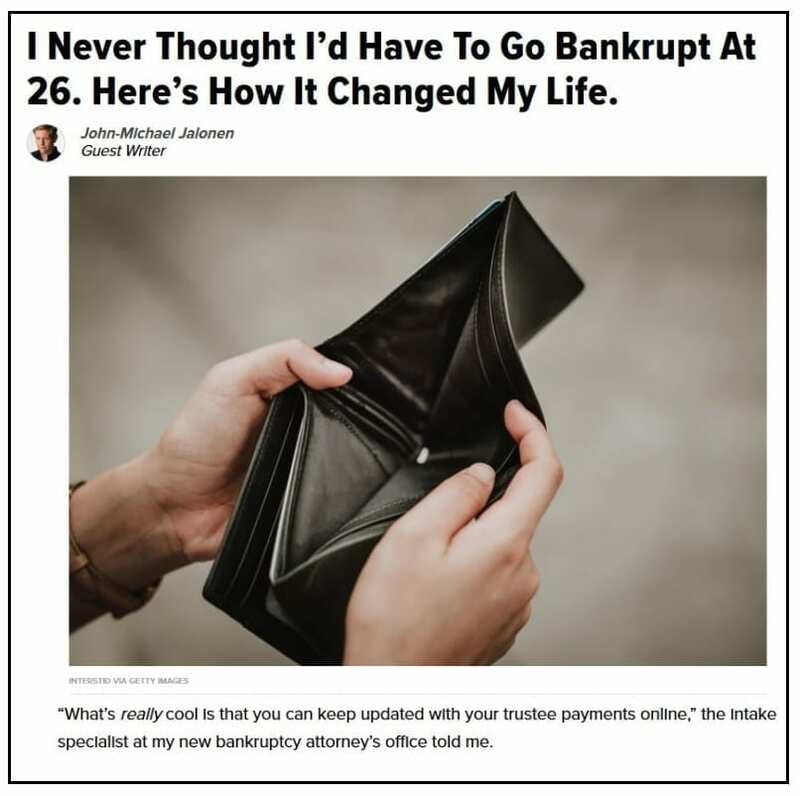 Many people have bad feelings about bankruptcy, the truth is that bankruptcy is a beneficial financial strategy used by over one million Americans last year and by some of the most successful people (Donald Trump, Walt Disney, Mark Twain, Thomas Jefferson, Henry Ford) to clear their debts, stop their worries, and get a SMART fresh start. It is rare and invaluable to have lawyers that have previously worked for both the Bankruptcy Trustee’s office as well as debt collectors working now for you. Every legal requirement, limit, and process is known by our expert attorneys. Our firm prides itself on our friendly attitude and personal attention to each client. We’re responsive to your individual needs by providing candid, easy to understand legal guidance…that works. For your convenience, an online case evaluation is available at no charge by simply clicking the highlighted words here. The linked page contains all of the information necessary in order for us to effectively determine if you qualify, and whether personal bankruptcy is the best financial solution for your debt relief. Please answer as accurately as possible, we’ll normally respond to you within 24-hours. Under Federal Law we are a Designated Debt Relief Agency. We help people file for bankruptcy relief under the Bankruptcy Code. We offer a free consultation to help you evaluate your options. We have saved our clients thousands and thousands of dollars and headaches by helping to quickly resolve debt problems. With just one easy visit to our office, your financial worries can be reviewed by experts. I was in a car accident on the 10 freeway with a friend on the way to my birthday dinner. We ended up being rear ended and my car was totaled. Allen immediately made us feel at ease and answered all of our questions, helping us make a well-educated decision in what our legal options were. I ended up getting treatment which greatly reduced the pain in my back from the accident. In addition my friend and I were handsomely compensated as well. Definitely recommend him. I would highly recommend Steers & Associates to anyone who was having to deal with bankruptcy issues. They took care of things quickly for me and did all they could in order for the situation to work out in my favor. The attorneys who represented our case were very professional, prompt, caring, positive, exact and very candid. They made the whole experience through the legal battle seem very pleasing, and we were very satisfied with the results. I would, and as a matter fact, I have highly recommended this law firm and the attorneys to my friends and colleagues. Great experience, noble attorneys and an ideal staff! My accident was something I would not wish on anybody, but if one ends up experiencing what I did then they would surely appreciate the personal attention that Steers & Associates gives to their clients. Everything was taken care of for me. I was very happy with the results.